Well you have survived the first year and hopefully the big first birthday party 😉 Your little one is crawling or walking around and getting into E V E R Y T H I N G and life is suddenly getting busy! If you haven’t finished yet, be sure to child proof everything. Your child’s curiosity could get her into trouble! Not only are those gross motor skills developing at rapid speed these days but so is her speech and language. In fact, at 12 months she may have said her first real word. But what is a real word? 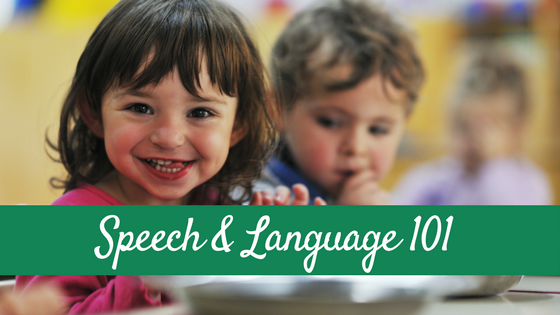 If you didn’t catch last week’s post on first words, go check it out and then come back for speech and language development from 12 to 18 months! Cognitively, your little one is beginning to use common objects appropriately. For example, she is trying to learn how to use a spoon, put keys in the door, and puts your phone to her ear. She is imitating new motor movements she sees you do (like stomping your feet) and she is starting to be able to remember that she was playing with her favorite bear in the living room and will go back there to look for it. She may be starting to be interested in stacking objects like blocks and may be able to make a 3-4 block tower by the end of this time! Receptively (what she can understand), she will be able to name some body parts when asked, follow more simple commands (come here, get your shoes, open the door), and answer simple questions like “Where is the doggy?” or “Where’s your shoe?” Around now you should be seeing your little one start to take part in more “pretend” or “symbolic” play. That is, you should see her pretend to feed a baby, talk on the phone, or drink out of a toy cup. She should enjoy playing around other children (they don’t play “together” quite yet) and should be showing interest in other children in general. 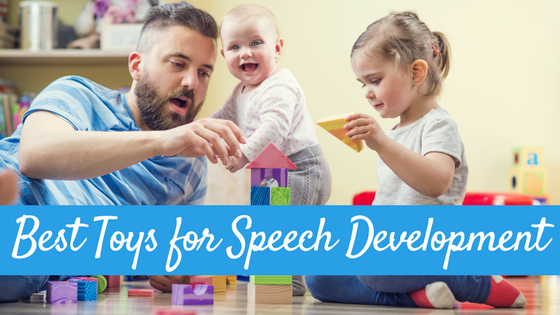 During this time, you are doing many things (mostly unknowingly) to help foster your child’s speech and language development. When your child points at something, you respond by talking all about it. When he says something, you often repeat it and then expand on it. When you are roaming the grocery store, cooking, or doing other errands, you are probably narrating your actions. Not only that, but you probably find yourself narrating your child’s actions throughout the day as well. 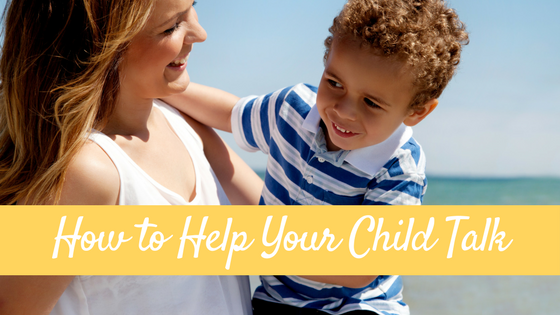 All of these things are helping your child learn language! Keep it up! 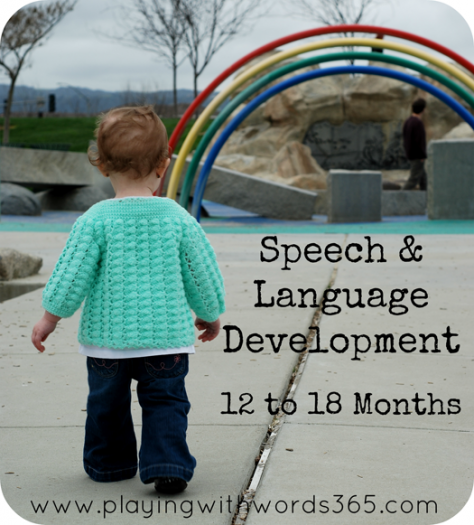 The time period of 12-24 months has one of the biggest ranges of “normal” in terms of speech and language development. Some 12 months olds have several words while others will not utter the first word until closer to 15 months. Some children at 24 months are speaking in short sentences while others are just beginning to to put two words together. And this is all normal. That said, there are some red flags to watch out for during this time. Check out my RED FLAGS page for more information. So now your child is starting to talk, is walking, pointing, and beginning to pretend! She has somewhere between 10-50 words, is following simple commands, and follows your point with her gaze. She remembers where she last saw items and will go look for them. What’s next? 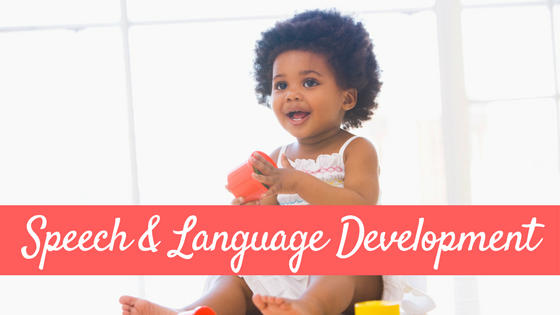 Next week we will talk more about your child’s vocabulary development and how he is communicating to you in Speech and Language Development 18-24 months. If you haven’t checked them out yet, here are the first installments in this series. See you next week! This, the first word, and the red flags pages are great! Nicely lines up and clarifies the information I’ve heard before and adds lots of good info too. You mention gestures and signs as communication, would you say those count towards the 8-10 words a child should use by the time they are 18 months or do those need to be verbal? My nephew is very communicative but only says “car” and “more” verbally, he knows and uses lots of signs and gestures very effectively. He’s 16 months and my sister-in-law was warned that they’d be discussing speech therapy at 18 months if he doesn’t get more words. Hi Alison! Welcome 🙂 Regarding words, no the 8-10 words refers to actual verbal words. My own son barely had that many at 18 months. Like I said by 21 months though he is finally learning MANY new words every day! My son had well over 50 signs by 18 months, however, and all other areas of his development were normal or above normal (advanced gross motor skills, excellent receptive language and ability to follow directions, imitated gross motor movements etc) and as an SLP I knew he was OK. It is pretty standard to have a pedi recommend an eval around the 18 month mark if there are few words just to have an expert at least take a look. At 16 months he could very likely hit a language explosion soon! This is a different Alison than the one that posted above. I was so happy to find your blog today. I’ve been trying to find some online information with substance regarding my son’s language development, but have only been able to find basic milestone lists (which are all completely different, it seems!) and scholarly articles full of jargon that I don’t understand. Your blog seems to be so practical and thorough. Thank you! I’m going to be taking my son to the dr. to get him checked out this month, but I’m a little concerned that he need some language help (and my husband and I need some help with helping him) since he is 15 months and has no words and doesn’t point at anything. He babbles, reaches for things, interacts, protests, etc. and seems very alert and hears well, but the actual words and pointing are missing. My husband and I are both fairly quiet people, so I’ve realized from reading your blog that we likely don’t do nearly enough parallel talk and self-talk with him, among other things. Do you have any specific thoughts or insights for us? Hi Alison. Some children are late pointers. That said, it is a good idea to talk to your pedi about your son’s development. 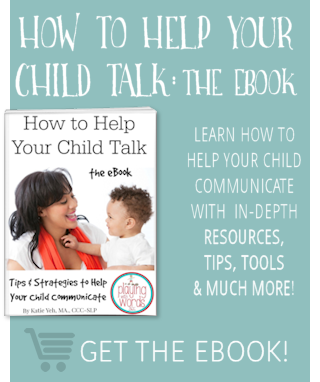 A wonderful resource I often direct parents to is Hanen’s It Takes two to talk program/book. It is full of fantastic information for parents! Good luck to you, and I hope those first words will be coming SOON! 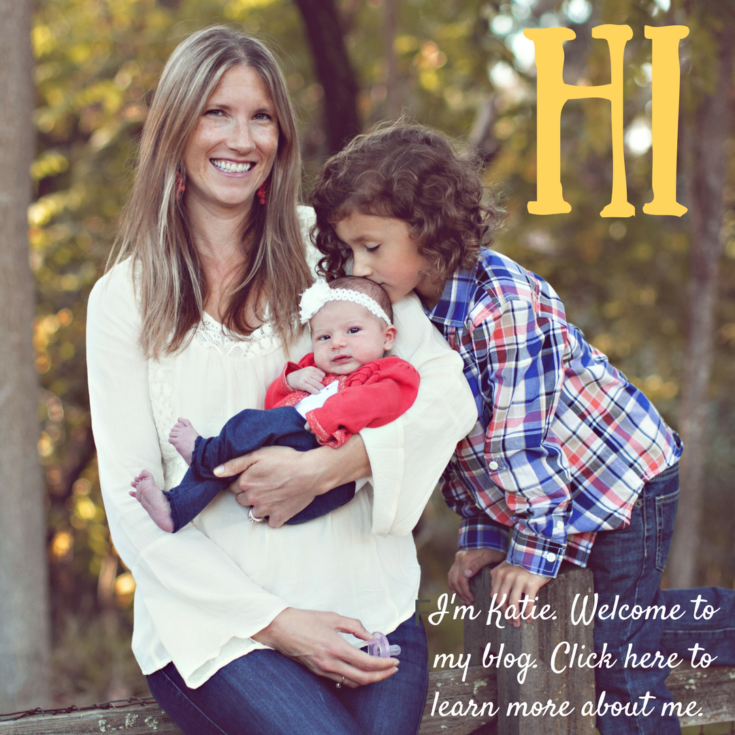 I am wondering if there is anything I should do to encourage my daughter who is extremely verbal. By the time she was 1 she had at least 30 words and was putting some words together (e.g. Hi Dada, Bye bye Mama, Dada bubbles, nice dog, etc). She can also understand complex directions like, “Can you put the sock in the laundry basket”. She’s 13 months now and probably says about 50 words but I stopped counting. Should I be talking to her as if she is 24 months? Doing anything special? HI! I am so glad I stumbled upon your site. My daughter just turned 13 months yesterday, and at her 13 month appointment the nurse was surprised she isn’t using “mommy” and “daddy” properly. She has 4 other words she uses properly and in context, but everyone is “daddy” to her. She says “mama” but usually when looking at her own picture. How can I encourage her to learn it correctly? And is this concerning? She babbles all day long, and uses the the words she knows over, and over, and over all day long. repetitively. But she is learning new words almost every week. Hi, Great article! Very simple and understandable language. My son is 15 months old, we had early-on (speech pathologist) come to evaluate our son was he didn’t have any words . I was nervous as he had his ear tubes last week as he had 5 ear infections from his 6 th-12 months. She said he has communication delay 45%. She said though he has receptive delay she doesn’t see any red flags. He understand almost with visual cues (if I ask ball he will go near the ball take them and if extend my hand he will come and give it to me) he understand come here, time to bath, open and close the door, look up, down, take the cup..
She also confirmed she didn’t see any other red flags as she would kind of know by being with the kid for 1 . My son will be on Speech therapy like once a month but trying to get help from private therapist also like once a week. Please let me know what else can I do to help my son..